The AHF, in conjunction with Palm Beach Classical Fencing hosts an annual classical fencing tournament held in South Florida, every spring. 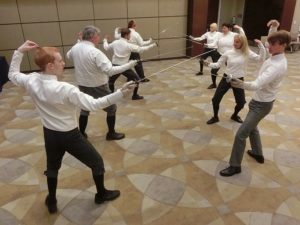 This event offers a perfect opportunity for the classical fencing community to celebrate the art, science and spirit of classical fencing, meet other fencers from around the country, and test their skills in what is always an exciting event. This is an open tournament and is currently the only AHF tournament that includes participants younger than 18 years of age. Participants come from around the country as well as from local clubs. The structure of the tournament allows the participants to contend in the same category regardless of age or experience. Each year this event grows both in number of participants and size of local audience. Spectators are always welcome free of charge. Saturday, April 6th. Palm Beach, Florida. 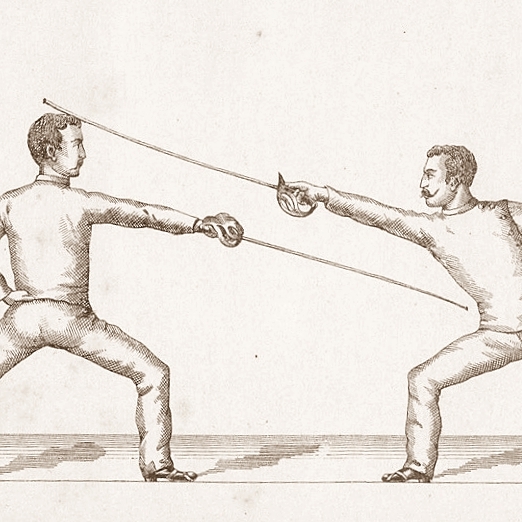 Weapons to be fenced this year include foil, dueling Sword, and sabre. Please read the rules available online here if you are competing. Registration must be received by March 31st, 2019. Fencers must be at least 12 years old to participate. Spectators welcome to observe the tournament free of charge. You may arrive any time between 9:30 am and 4:00 pm. Note that videotaping and flash photography are NOT permitted. You may take still photos, but please do NOT use a flash. The Vicki and Peter Halmos Family Activities Center is located at 250 Seaview Ave, Palm Beach (see map). From I-95, exit at Okeechobee Blvd heading eastbound (exit #70A). Continue heading east for approximately two miles, then straight over the Royal Park Bridge to Royal Palm Way on the island of Palm Beach. After a few blocks turn left (north) on South County Rd. Go one block to Seaview Ave and turn left (west). The venue will be halfway down the block on your left side. Please park on any labeled spot, and note the parking regulations. Additional metered parking is available behind the venue, accessible from Royal Palm Way. The closest airport is Palm Beach International Airport (PBI), located in West Palm Beach, less than five miles from the tournament venue. For the best prices on flights see your favorite travel website and/or check individual airlines’ websites for special offers. April is still tourist season in Florida so book your tickets early to ensure prices and availability! Taxi, shuttle bus, and rental cars are available at the airport. Numerous hotels are available in the area; visit your favorite travel site to find the best prices. A relatively inexpensive place to stay is Studio 6 West Palm Beach, which is approximately three miles from the tournament venue.